This is my simple philosophy when it comes to ordering from a menu. Let me explain. Depending upon the restaurant, chefs will always have the usuals or as I like calling them, their safe bets. These are the crowd-pleasers that are uncomplicated and perfectly satisfying for those looking to silence that grumble in their tummies. But when I go out to eat, I always seek out the unusuals on menu. A chef would never risk putting something ‘weird’ on the menu unless he or she really believed in the dish. And besides, there are always those oddballs like me who are looking to try something new or out of the ordinary. Which brings us to the topic of Restaurante Pia y Damaso. While most menus are really functional bores, Pia y Damaso’s menu is actually intriguing. Funny, sassy and innovative, their menu actually made me excited to try their food. A rare occurrence, to say the least. But a menu is only words on a piece of paper; it’s always about the food. Since a restaurant is only as good as the food it serves, I knew I would eventually be back soon. The following weekend, we park ourselves at the stylized tables of Pia y Damaso order a little snack. I know that Nga Nga Beef Salad (P250) has nothing in common with a leafy packet of betel nuts besides that they are both wrapped up before consumption. But after reading the above description, how do could I resist this do-it-yourself, rolled-up salad that has haw flakes as an ingredient? For those of uninitiated few, haw flakes are made from the fruit of the Chinese Hawthrow tree. These pinkish, disc-shaped Chinese confections became quite popular as a recess snack during my grade school days and are apparently a mini-food obsession I never really go over. On the plate, this dish reminds me of a little garden—little rows of differing hues of green running parallel to perfect lines of red. Lovely. So pretty, in fact, that it almost seems a shame to eat it…almost. I’m sure you’ve heard the line, “It’s like a party in my mouth!” Well, this salad is not just a party, it’s a beat-thumping, crowd-jumping rave. 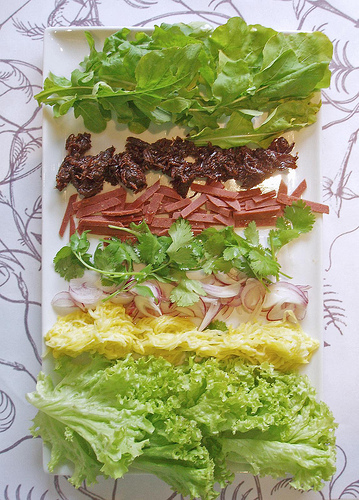 The flavors are clear and distinct: the saltiness of the beef, the tangy sweetness of the pickled green mangoes, the candied plum tang of the haw flakes and peppery dab of the arugula. But wrapped in the slightly bitter crunch of a romaine lettuce leaf, these tastes seem to meld into each other—creating the perfectly balanced bite. 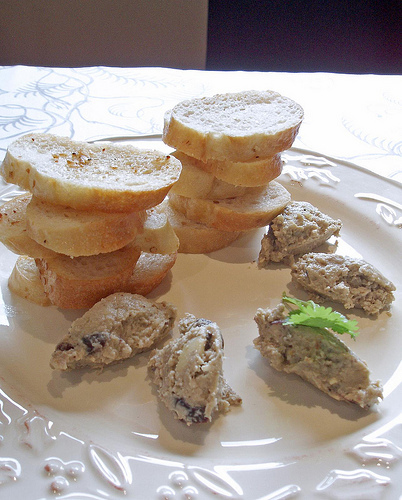 Turkey Pate with Pistachios and Cranberries (P250)? Sounds like Thanksgiving all over again. And since my dear A loves her pate, we ended up ordering this starter for a taste. Sadly, once the dish land on our table, it was a visual downer. Expecting the colors of a Thanksgiving meal, what we received was a plate of drab quenelles of brown, punctuated by a sad leaf of parsley. Not a very delicious image, to say the least. Putting aside our misgivings, we forge on and give the dish a taste. Unlike the “party” Beef Salad, this pate is a lonely one note. And that single taste is liver. Where is the turkey? Where are the cranberries? Where are those bright, earthy flavors of nuts, citrus and spices? Where is my Thankgiving pate?! Accross the table, A smiles as she happily speads her pate on the much-too-crispy toast, one after another. I shrug. To each his own, I guess. Sometimes, getting out of your culinary comfort zone can yield amazing discoveries. Sometimes, it can become a gastronomic train wreck. But the benefits will always outweigh the costs. In the end, you just never know what new avenues of flavors you may end up savoring. Mamou - Panjee? Where are you?